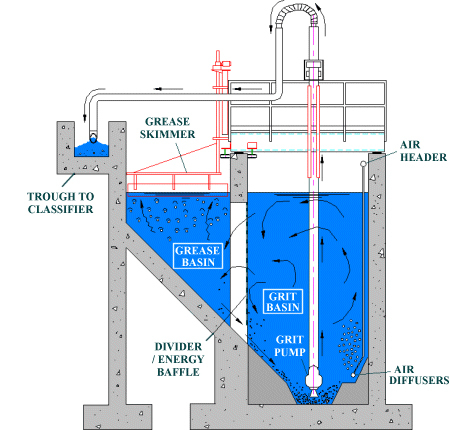 Grease and grit removal systems utilize a dual compartment basin, separated by flow control baffles, and incorporates adjustable air flow rates, a foam control system (optional) and fully automated devices on all grease skimming equipment. 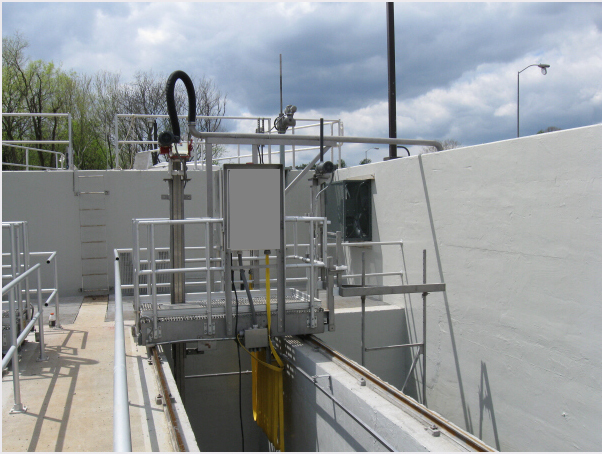 In addition to removal of grit, which helps eliminated down stream damage to other plant equipment, the pre-aeration and grease process removal process also contributed to B.O.D. reduction. Grease and grit systems are available in various sizes to accommodate flows to 25 MGD. The parallel basin configuration incorporates an aerated grit basin and a grease collection basin. The grit basin rolls the grit and promotes rapid settling. the settled grit is pumped from the basin to an effluent grit channel, passes through a grit classifier where the grit and fluid is separated and removed. The quiescent grease basin promotes fast and effective removal of grease and other floatable. The floatable are skimmed via a full surface-skimming blade, collected into a scum pit, then discarded. Grease tray lift assemblies and grease removal screws are also available as options.